Do you have any Valentine’s traditions?? Seriously, how cute are these little M&M filled Honey Bears? And so simple! I purchased 5 (I had one in my pantry) Honey Bears and transferred the honey into small mason jars. After you wash the “bears,” make sure and let them air dry for a day before you fill with Valentine M&M’s. I inserted a red/white straw so it was obvious that they could also be used as drink bottles. I think that little ones would also love the empty bear bottles as bathtub toys. 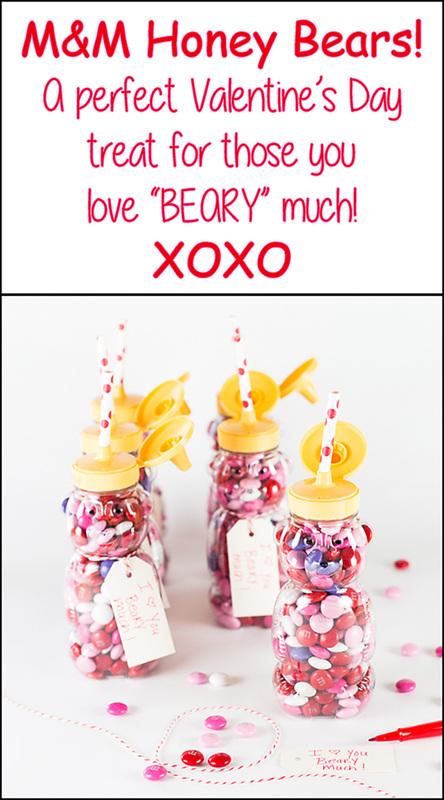 Don’t forget to add a little tag to remind your little ones that you love them BEARY much!! I’ll definitely be making up these M&M Honey Bears again! How about making this Make-Ahead Oatmeal with Honey and Raspberries from Karen’s Kitchen Stories. Or maybe some Homemade Peanut Butter. How delicious would that be for those PB&J sandwiches! Thanks Served from Scratch for making our sandwiches just a little bit healthier! I think the little ones might also enjoy these Honey Balsamic Roasted Carrots that Chrissie, The Busy Baker shared with me. Make sure and head over to Southern Plate and check out her Meal Plan Monday! These are sooo cute!! What a great idea! What a cute idea! I love how simple and cute these are! 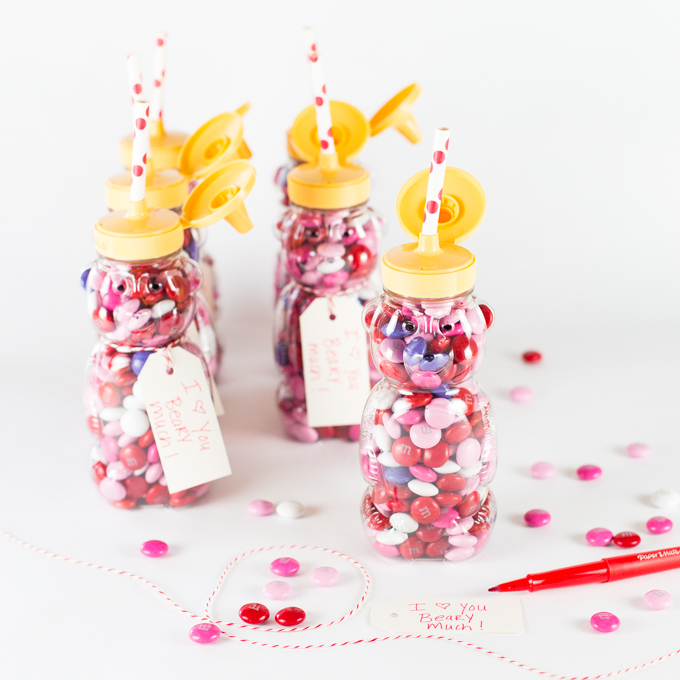 Darling little honey bears all dressed up with valentine yums! The kids will adore these! I might have to go get some honey bears and get cooking honey recipes! These are just too cute!! These are so cute, what a great idea! We love M&Ms. Renee! These are precious! I wish I would have saved all my honey bears from this past year! I could give away a handful of these adorable bears! I’ll pin this and keep it in mind for next year. SO CUTE! These are just so cute! I would have never thought to reuse those bottles, but I gotta start buying honey in the bear bottles. LOVE these!! Happy early Valentine’s Day! !